The new 2013 Scion FR-S is already an icon with its fans and is now a race-ready model that will be the official race vehicle for the 2013 Toyota Pro/Celebrity Race. Fans of the new 2013 Scion FR-S will be thrilled with what Toyota has done to the rear-drive sport coupe. Toyota Motorsports and Scion announced that the Scion FR-S sports coupe will be the official vehicle of the 2013 Toyota Pro/Celebrity Race. This is a dream come true for fans of the two-door sport coupe who have been wanting a faster version of the car that was co-developed along with the Subaru BRZ. The new race car could be a preview of what Toyota has in mind for future production models of the Scion FR-S and the global Toyota GT 86. The Scion FR-S race car marks the first time in 27 years that a rear-wheel drive sports car will serve as the designated race car. Twenty five examples of the race-ready car will be produced, and the build video below shows the Toyota Racing Division transforming the stock FR-S into a race vehicle. The Toyota Pro/Celebrity Race will take place April 20 and marks the 37th anniversary of the charity event held annually as part of the Toyota Grand Prix of Long Beach weekend. The 25 race-ready FR-S cars will produce 210 horsepower, and will come equipped with performance enhancements that include a range of Toyota Racing Development (TRD) products. The extra performance goodies include stainless-steel exhaust, coil-over shocks and springs, big brake kit featuring Hawk Performance brake pads, performance air intake and 18 inch wheels. Other custom equipment on the Scion FR-S sports coupe includes a Centerforce single disc racing clutch, front MacPherson struts and a rear double wishbone suspension. Celebrity drivers will drive the FR-S race car and compete for a chance to earn yearlong bragging rights and acknowledge charitable donations made on their behalf. Past celebrity drivers have included Hollywood elites such as Keanu Reeves, Ashley Judd, Adrien Brody, Cameron Diaz, George Lucas, Queen Latifah and Jay Leno. The Toyota Pro/Celebrity race has evolved into one of the longest-running corporate-sponsored fundraising events of its kind, pitting celebrities from music, sports and film against professional race drivers. The event benefits “Racing for Kids,” a nonprofit, national fundraising program that supports children’s hospitals throughout the United States. The all-new 2013 Scion FR-S is wildly popular in the U.S. along with the Toyota GT 86 around the globe. It was launched last summer and has received many global awards including being named Best of 2013 Cars.com, earning a spot on Car and Driver’s Ten-Best List 2013, and winning the first-ever Car of the Year award from AutoGuide.com. 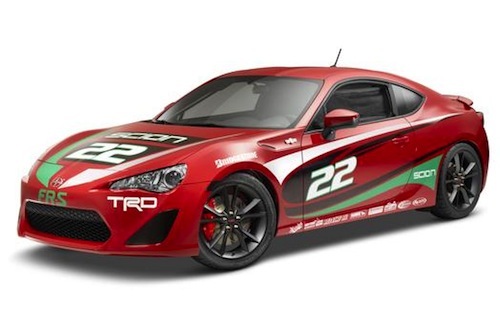 Scion FR-S fans can get excited about this new race-ready car developed by TRD. It could signal a new production FR-S high-performance model coming in the future.